This guide is in no way finished or has every feature added, the guide is also not in any order, but once the editor has got the Improvements that the devs want to add I will re-write this guide In a way that will make every ones life easer. At the momment I am just adding things as they are found or added. Once the editor has been worked on I will add tutorial Videos too. There has been a lot of question and confusion on IRC and Forums about how the editor works and how to do things, so I thought I do a guide to help. The 1st thing you should really do is set up binds for different commands, It will save you lots of time and lots of typing. You can find Commands and properties in C:Program Files (x86)SteamSteamAppscommonReflex the file name is readme.html I recommend that you read this file as it also gives you the ports you need to open so other's can connect to your server if you don’t run a dedicated server. Since build 0.33.2 there is no longer a editor.cfg file, to make the distiniction between game commands and editor commands you will have "game" and "me" before the command. "game" is for the game (duh) and "me" is for the Map Editor. In your install folder normally C:Program Files (x86)SteamSteamAppscommonReflex you find an editor.cfg 1st make a copy of this file, in case you mess up, Also back it up cause on each build all the configs get reset atm, then open it and paste in the binds. You can take out any // (Comments) it will bring up an error if you leave them in but they don’t have any effect on any thing, just atm Reflex don't understand comments. You can use any keys you wish, these are just the ones I'm using. Also it's best to save your map before you start. Type in the console savemap mapname then reload the map with the command map mapname so that you don't over write the empty map by mistake, then you can use the bind to continue saving. Ok I did a config called brush.cfg just copy it to your Reflex folder (C:Program Files (x86)SteamSteamAppscommonReflex). This config has been broken up in to the different categories so you can easy find what you need. What keys can be use to bind a command too? Shortcut keys can be found in the readme.html file but I will give you them here with some explanation to each. Shift: Used for moving brushes at the same hight they was created, Also used for adjusting faces of the brushes. To move the brush you need to select it 1st then with the mouse drag it around, it will move on the same hight plane you created it. To adjust the brush size, select the brush then with the mouse highlight the side you wish to adjust, you will see a white line on one side of the brush then you can drag it to resize, you will get use to which place the white line will be on to which side to adjust. ALT: Use Alt to move the brush up and down vertically. Backspace: Deletes the brush or object. G: Will clone the brush or object, the clone will appear but slightly closer to you and slightly up above the original, so if cloning multi brushes (IE for making stairs) try to do it by facing the direction you want then to appear. V: Vertex editing, when press V you will see small dots appear on the corners of the brush hovering mover over the dot will give you a circle, left click and drag to move the vertex, You can use the Alt key the same way as normal to move the vertex up and down. This is a good way for making ramps, but as there is no way to to rotate the brushes you can us the vert editing to do rotating by hand, It's messy but till they Implement rotating this is the best way I have found. I "discovered" something, insofar as I used this guide to get started building maps, did a thing accidentally, and did not see it mentioned anywhere. In vertex editing mode you can use backspace to delete a vertex from a brush. If you create a 64x64x64 cube, go into vertex mode, and then mouse on the nearest top-left vertex and press backspace, and then do the same for the nearest bottom-left vertex, you'll have a very quick 45 degree angle. I'm new to mapping so all I know are the guides I've read here, and I haven't seen this anywhere. It has changed my life compared to editing vertices freehand. Like I said vert editoring can be messy, some times I found deleting verts dont always snap to the next vert you expected it to, If you find this to happen use X to undo. To make a 45 degree angle you can also just move one vert over the top of another and it will merge then together. Z: Will undo, I have no idea what the undo limit is so if any one know please post it. X: Will redo, again no idea of the max limit. M: Applies the current material. To get a current material use the ContentBrowserHack.exe which can normally be found in your C:Program Files (x86)SteamSteamAppscommonReflexcontentbrowserhack. To get the material select the material you want from the browser, make sure the console is down then click Send to Reflex and you should see the material name pasted into the console. For now use the textures in the base/structural/dev folder as you cant add your own at the momment. You can apply materials to just one side of a brush by using shift + m with the mouse over the side of the brush you want the material on. Now some people are having problems with the ContentBrowserHack not pasting into the console, sorry but you are going to have to type it in by hand, just find the material you want and type in the path. People also have problems with not beeing able to see the ContentBrowserHack when going into window mode. I have noticed that Reflex can stay on top of all other windows so try going into window mode and resize Reflex like any other window or try using a different r_resolution. Shift + k: will copy a material from any brush on your map, just select the brush you want to copy the material from. ALT + TAB: Switch between window and full screen. Some people are having problems with getting either window or full screen sorry I don't have an answer to this problem. Another problem (one I get) is switching between to many times, suddenly the monitor gets lines running up and down and the screen shifts to the right, the only way I have found getting rid of this is to reboot. Light leeks: Some times when building a Lightmap you might see light leaks appear you can get rid of some of them (this does not work all the time) by using the nolight material on one side of the brush you can find it in the browser under base/internal/editor/textures/editor_nolight. Lightmap building: some times when building a lightmap and you come out of edit mode the lighting can seem to change this is because of r_lm_textel_size being in your game config you can comment it out using the // this will fix it, but that comes at a price as the build time will be a lot longer. A players hight is 56 units. To place lava make a brush then get the lava material from the ContentBrowserHack its under base/environment/liquids/lava/ and you want the lava material make sure you have a brush under the lava to stop players falling through. The dev_light_ textures under the base/structural/dev folders will give a glow like a light source. Praxismo done a great post on how to easy put colours on to your brushes. Check out his post, Like and send some love by thanking him for the post. Arkore also did a texture map to help with adding dev textures to you own maps if you have problems with the content browser hack, Send him some love by liking the post and leave a comment saying thanks. Bonuspunkt done a guide on jump hights and distances great info in there and well worth reading if you want to make that perfect jump map Give him some love by Likeing and comment a thank you for the hard work. Pick up placement: Use the N Key to get the properties box up and use the numbers below to add the Pick up you want. Most of this info can be found in the readme.html file and from the youtube vid tutorial https://www.youtube.com/watch?v=Brg5eiOzIIU made by Reflex. All I have done is elaborate on some of the stuff. I will add more as I work them out. If anyone else has any stuff they think should be in here please post it below and I add it or if you see any mistakes do the same. Use the me_createtype effect effect command in the console or use bind key 5. Place the effect, with the effect selected press N key to get the propities up, click in the bottom text box and in the content Browser Hack go to Internal/world/teleporter and choose teleporter_portal the type Effect, then change the angles as needed. Now you will need to create the teleportal it's self so in console type me_createtype teleporter or use your bind if you have one, Like the brushes just click and drag it to the size you want it. Press N to get the propities box up and in the target field type in a unique name, Thing to remember is to press enter once typed or it wont save the name in the text field. Next you need to make a Target for the portal, in the console type me_createtype target or use the bind if you have one, place it where you want the player to emerge from the portal, press N key for the propities box and set the angle on the red brush you will see a pointer for the direction the player will go use that to get correct direction. Then in the name text field type in the same name you gave your teleporter and remeber to press enter to set the name. Now test your portal, remeber to move it around to get the correct exit point for the player. If for some reason the text does not get put into the text field from the content browser make sure you have the text fiekd selected, it will look gray if selected. If for some reason your text you type in the text fields are not there when you re select propities then you have not hit enter. Use Bind key 5 to add an effect, Press N key to bring up the propities box select the effectName field (it will turn gray if selected properly), then from the Content Browser Hack select structural/decals/decal_dev_logo_reflex and click send to reflex (Make sure you select EFFECT and not the MATERIAL). In irc and forums I have seen people having trouble the decal showing up, with some playing around with it and the materials on the walls I think I have found the best placement of the Effect Entity. The Effects Entity works best if set 2 to 3 units from the wall, The angle also come into play, once the Effect Entity has been placed I find that diffrent angles can effect weather the decal shows or not so try adjusting the 1st box for the angle (I'm takeing it as the Z axis) in incerments of 90 degrees so 90, -90, 180 etc. I have not yet decided on how to tell what face of the Effect Entity is front or back, so play with the Z angle. The bind key was left out so I bound me_createtype pickup to key 7. Place the Pickup Item then Use the N Key to get the properties box up and use the numbers below to add the Pick up you want. Remeber to press enter after adding the number you want. Use bind key 3 to create a JumPad, to place it drag it out just like a normal brush, set the size you want then Press the N key to bring up the properties box, In the target field type in a unique name (one that you can remember and relates to the area the JumpPad is in IE: quad1), remember to press enter after you have typed in the target to set it. Now go to the place you want them to jump up to and use key bind 4 to set a Target, Press N key to bring up the properties box, and In the name field type the same name you used In the JumpPad properties box, again remember to press enter to set the name, (what you have done is connect the two together thats why It's Important to use the same names In both properties box's). Next you need to place the Target Entity so the player can reach the ledge or platforum you want then to jump to, noramlly It should be above and in a bit, you will need to play with the placement of the Target Entity to get the best Landing spot. Do the same as above except now you are going to make the JumpPad in to a ramp. Press V to go Into Vertex mode and raise the 4 vert's upwards (use Alt key to move the verts up and down) , try to make the ramp point upto the ledge or platforum you want the player to land on. Next place the Target. There are two ways to do this (I'm sure there are more, these are the two that I normally use, so try and test other ways if you wish). 1st way: Stright fast ramp jump. Place the Target like you did above on the ledge or platform. The player will fly quite fast to the landing spot. 2nd way: slow Arc. Put the Target about halfway to two thirds of the way from the ramp and up high, you will get a slow arcing jump. Now you will have to play around with the exact distance and hight to get the best speed and look you are after. With this type of JumpPad you will find that when the player lands there is a skiding movement on the landing so becarefull if you have a platform with no walls as the player could slip off, again its trail and error getting the landing the way you want It. When making stairs place the furest one 1st then facing the camera to the back of the stair with you back towards the place your building upto use the G shortcut key to duplicate the 1st stair and it will paste the next one one unit up and one unit over in the direction of the camera. you can re-theme maps by doing a simple find and replace in the .map file for the material name for example turn all your grey walls to blue. You will find the map files under C:Program Files (x86)SteamSteamAppscommonReflexbaseinternalmaps and just open them with a text editor like wordpad. Neon lights are just textures you apply to a brush just as you would with any other texture. Use the content Browser Hack and send over the texture and use M to apply, remember to have the console down when sending over textures. The textures are in structural/dev and called dev_light_* The * is the name of the colour you want to use.IE: dev_light_blue. Now a lot of people will place the neon light and it will only come up white, this is because most of us had to dumb down our option via the config, so most of us have r_bloom disabled, to see the diffrent colours you will need to re enable r_bloom 1 to see the colours. *Thanks to Bonuspunkt that helped to find out the reason behind seeing only white neon* (I will write a bit about setting up diffrent configs for playing and editing). Now It might seem silly to write about configs as there are diffrent configs for game and editor. What I have found is that some of the setting you turn off in the game.cfg can still effect the editor.cfg. ALWAYS BACK UP YOUR CONFIG FILES BEFORE CHANGING ANY THING. When swetching between game mode and edit mode if you bring down the console you will notice that the program changes between the game.cfg and the editor.cfg, so you can use this to your advantage. In the game.cfg I use this. Remzi made this post and will be adding more to it over time. There are some very good tips and quite a debate going on well worth a read. Give it some love with a Like and a Thank you comment. Now my Tip for good mapping habits: Once you have your 1st stage layout done open you server up to the public (Remember to save before hand), just spec and watch people play. Look out for, Areas not being used, Players trying tricks (is it easy/hard), are players doing what you expect them to do (may be ask them to try dif things, most will be willing to do so), when players re-spawn do they find it hard to get a weapon. Now take that info and start stage two, refining the map, again open server to public, and rince and repeat untill you have a finished map. Devils Mapping Tips, This is great reading has great tips on map size, brush size, Lighting tips and more. Jump over and give some love by liking and a comment saying thanks for the hard work. Some people are having problems with sending items to ReFlex, from what I have found out it's normally to do with keyboard layouts, You will know if this is your problem by doing a test. Place an effect and try to send over the teleporter effect in the proprities if you have a layout problem you will see internal?world?teleporter?teleporter_portal all the will be replaced with a ?. One way to over come this is to high light the item you want in the content Browser, and then press Ctrl C for copy then in the effectName field press CTRL V to paste. You have left out some important details that I can cover- the PointLight entity. By typing me_createtype pointlight, you can create light sources on the map. By pressing N and adjusting the parameters nearAttenuation and farAttenuation you can alter the amount of units the PointLight will light, as well as how much brighter it will be the closer you are to it. I would not recommend changing the intensity parameter. This is useful because the lights that you can find in the content browser are not bright enough to properly light rooms. You will notice that to light a room olny with those lights will be very difficult. Take the attached image as an example. 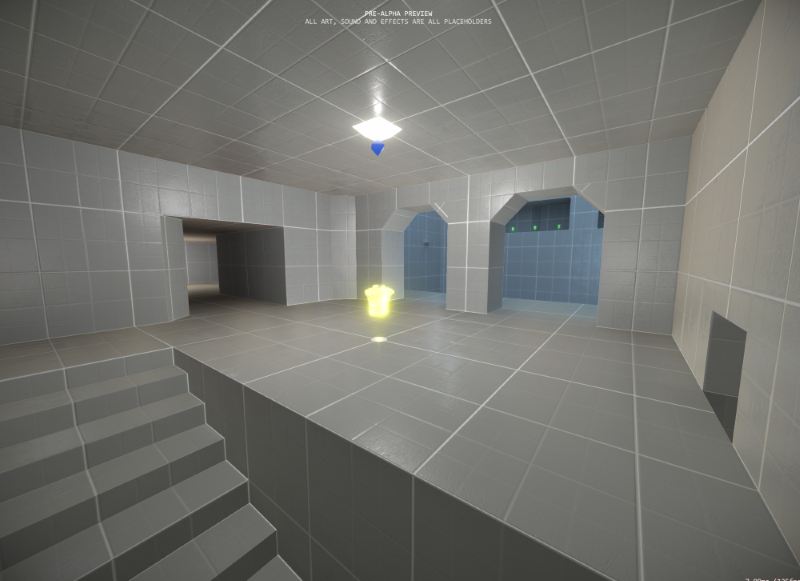 The light block on the ceiling is far too weak to light the room, but by placing a PointLight entity I am able to make it appear as if my light block is lighting the room. You can go into edit mode on my map, ikadm2, if you want some good examples of its usage. I hope this is helpful! Very useful. I will post this in the stickied thread. Thanks a lot! Thanks for pointing this out, I have added this to the list and Contributed it to you. Good post. I'll sticky this. I'm going to make a guide like this with some modifications later on, as some of it isn't entirely correct. But it's good nonetheless. Would just like to thank you Zita for the key bindings you posted a while ago. I've been using them regularly and has helped my map editing go much faster. I customized things a bit for my own needs but I use most of them now on a regular basis. Updated the Binds section, as since the new build #27 they have inclueded some binds, so check out the new re-binds I have set up. Will be adding more content on how to create types soon. I was about to take notes while watching the Reflex Youtube video but this guide is even better. Thanks! Hey guys, is there currently any way to do the following in the editor? -Select multiple brushes and/or entities at once? -Mirror geometry across a given axis? If not, are there any plans to implement these features? I also noticed that key pickup items weren't bound so I bound them to key 7. Did the same thing as you did Zita. I take it this will be fixed in the next build? I also like how number keys are used now instead of the top F keys. Makes it so much faster and easier to see. Also love the brush status in the lower left corner. These new updates are improving the map makers efficiency. Because of all the updates it forces guides like this to be updated as well. Thanks for staying on top of it Zita. This means map making video tutorials will need to be redone eventually too. Yes as the game grows with more Imporovments the more guildes and vids will need to be changed. You're doing good work to package important information for new mappers like myself in a centralized location. Thank you for what you do. It's appreciated. What do worldColor0 and worldColor1 stand for? Or do they have any effect? Couldn't find any information about them at least on the forums or anywhere I looked. Unless something has changed, they don't do anything. They're old values that hasn't been removed. In build 26 they used slider controls to set the world lighting color (skybox). I don't think world color 1 did anything that I could see. I imagine they were to be used as skybox backgrounds where sky color = world color 0 and ground = world color 1 but they only implemented world color 0. Didn't look like world color 1 ever got implemented. So only global lighting color was used without possibility to implement skybox background images. I'm sure this will change in the future. Could we get the possibility to save the map we are working on even if we are not host? Maybe it is already in build 28, haven't checked. I worked on a map with some friends and at the end, host had to save map and send it via mail, so the rest of us could have it and play around with. Would be nice to save the map even if you are not host. That shouldn't be done until sv_private 1 exists. Currently there is no way to prevent someone from connecting to you if you have your ports open and are simply working on a map locally. So there wouldn't be any way of someone screwing up your map and hitting save. Since you didn't mess it up you can't undo the changes. Receipe for disaster. I'd rather see a list of approved connection aliases that are allowed to save maps. Since it's on Steam would be nice to use Steam names to accomplish that. Don't know if Steam private groups could be leveraged for that somehow. Would be nice. In any case a permissions list is needed.